Donations are a great and important way to help extend the efforts of camp ministry. 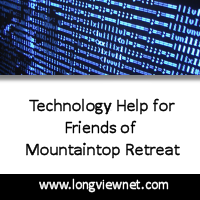 Mountaintop Retreat is recognized by the IRS as a 501c3 organization, thus, your donations, both financial and tangible, may be tax deductible. We do receipt all donations! We accept online donations through PayPal where you can donate using any major debit or credit card! Below is a list, though not exhaustive, of our current and most urgent maintenance needs. Wouldn’t it be wonderful if a church or sunday school class elected to take on one of these as a mission and ministry project? Contact us on how you can make a difference in the lives of campers by donating to our Maintenance Campaign! The Dining Room, & Kitchen needs to be remodeled $250,000. Two new dorms needed @ $100,000.00 each. Read more by opening/downloading this Adobe Acrobat PDF!